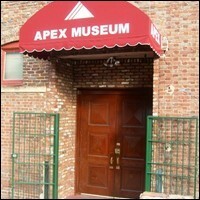 APEX Museum aims to accurately interpret and present history from an African American perspective. It strives to help all American and international visitors better understand and appreciate the contributions of African Americans to America, as well as the world. Parking: There is a parking lot adjacent to the museum. MARTA: Take the Red line to the Peachtree Center Station. Out of the station, head east on Andrew Young International Boulevard toward Peachtree Center Avenue and make a right. Turn left at Auburn Avenue, and walk two blocks to APEX Museum.